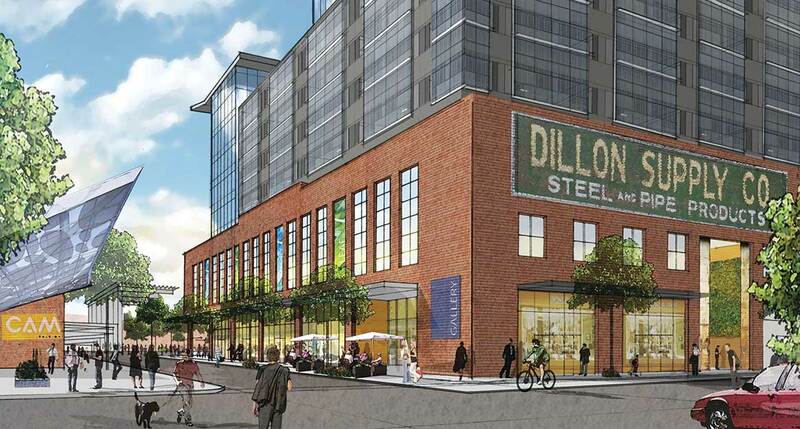 According to the May 26, 2015 Raleigh planning commission agenda, the rezoning request for the Dillon Warehouse Company building is at bat. I wanted to get into it today before the meeting and maybe follow up in the comments after the results. If you want to get into it, search the city’s website for case Z-1-15. Requires Urban General frontage standards for W. Martin Street with stipulation regarding retention of existing building façade. Requires developer to use “best efforts” to maintain building façade fronting on W. Martin Street. Requires a stepback for buildings over 5 stories and 75’ that front W. Martin Street. Requires that at least 65% of the southern block will have a building that is 9 stories in height or less. There are a few more that deal with parking but we’ll get to that soon. Just like the story at 301 Hillsborough, there are those for and against this rezoning. The opponents claim that 20-story buildings are out of place with the warehouse district and that removing one of the great warehouses would be detrimental to the area’s vitality. Those very pro-development want to see intense urban growth in the city’s core as well as making the most for our public dollars being invested across the street in Raleigh Union Station. Reading these conditions, it sounds like work has been done to perhaps make a compromise. I thought about it a lot and I lean more toward pro-growth and getting some bang for my dollar in the Union Station project. However, I do love the warehouse district and for us to even have a district at all we need, well, warehouses. My fear isn’t losing Dillon Supply as it sounds like there are conditions in place to help maintain the facade. I’ll be interested to hear discussion about the 9-story cap on 65% of the southern block as that may limit what a developer can do compared to 20. Still, 9 floors of active space is way better than the zero we have today. My biggest fear is of course my favorite topic. Parking. I wrote about what the Citrix project has done to the warehouse district and I fear the project here will do the same. Less intense development = less of a case for transit. That means large parking decks will be built and downtown is still not moving closer to being a multi-modal area. Raleighites will still find it more convenient to drive to this location, even when across the street from our central transit station. However, there are several urban frontage requirements that would not necessarily be addressed, notably design standards that would require structured parking to have active uses on the ground story between the sidewalk and the structure. The conditions do require that W. Hargett and W. Martin Streets have active uses between any parking structure and the rightof-way. The conditions also offer that at least 45% of the width of any parking structure on S. West and S. Harrington Streets would have a “non-parking use” between the structure and the right-of-way. While this provision does offer some guarantee of active uses (or at least nonparking uses) on the ground-floor on these streets, it still leaves a significant portion of building area – some of which would be directly across the street from Union Station – that would not be required to have active uses. We could see long stretches of the future development being long, blank walls (hello Citrix!) which doesn’t add anything to the urban form of the area. Again, that’s less desirable here because of Union Station being right across the street. The proposed rezoning is consistent with the Future Land Use Map and would allow an appropriate density and mix of uses on a site located next to the city’s future transit hub. However, the proposal is not consistent with the Urban Form Map as well as key policies from the Comprehensive Plan. The Urban Form Map and policy guidance from the Comprehensive Plan require an urban frontage designation or a conditioned equivalent, the latter of which the proposal has not fully provided. In my opinion, the request makes me nervous for the future of the warehouse district. I’m not talking about torn down warehouses. I’m worried about the warehouses being shells for parking decks. I want to see the warehouses incorporated into complex building plans that are interesting and are activating the sidewalks. That’s urban to me. I hope that the commission can take pause and not be swayed by an opportunity for parking to support Union Station masked by the face of “new development that supports transit.” For me, I need to see this issue improved for my support. I’ll definitely be watching this discussion and let’s get a conversation going afterwards.